L: 84" x W: 40" x H: 41"
Quincey Power-Reclining Sofa The Quincey power-reclining sofa offers supreme comfort and contemporary styling. Upholstered in 100% family-friendly polyester, this set combines modern style and high tech features into one inviting package. The Quincey power-reclining sofa offers supreme comfort and contemporary styling. Upholstered in 100% family-friendly polyester, this set combines modern style and high tech features into one inviting package. Four can actually sit on the couch, without recliners up, if need be, and big feature is that there is a USB port built into each end of the couch by the power buttons. Easy to get in and out of as chair is firm, yet very comfortable. we purchased a new power reclining couch for a home we purchased recently. We wanted one that would look good and made to last. The salesman recommended the couch with steel flex. It is very comfortable and modern looking. It has both the normal reclining and a separate control for the headrest. We expect to get many years of use out of it. This sofa is just wonderful. Our 15 year old sofa was sagging and creating back problems so long overdue to replace. Intended to buy a standard sofa but this reclining one was just the most comfortable thing I sat on in the store-and I sat on a lot of couches. This is our second Flexsteel item-bought a chair six months ago-and they are built like tanks. A real quality piece of furniture. I am very happy with this purchase. From the time w walked into the store thru the delivery the service was OUTSTANDING!! Linda was SUPER!! The sofa is high quality and extremely functional. I would definitely purchase and recommend R/F to everyone. The sofa arrived and looked just like it did in the store. A little on the firm side, which is fine. This is such a refreshing touch from our old couch. It had 2 non power leg lifts. The one on my wifes side was getting old and hard for her to latch. Now she has no problems with the electric. So nice. I still try to close it manually, but I am sure I will stop that soon. Dont be afraid to buy this couch. We bought 2 of them. Bought the Quincy Power Reclining Sofa and the matching Power Reclining Love Seat. The sofa is comfortable. When fully reclined, it's as though you are sitting in the movie theaters that have the power reclining seats. Love the adjustable Power Headrest too.The color (smoke) adds a to a nice contrast to the neutral color walls. We purchased this along with the matching loveseat on Veterans Day. Our salesman Ray was great, allowed us time to browse and never placed any pressure on us. Was delivered a few day later by friendly deliverymen. The power options, position, quality & comfort of this sofa is amazing. So glad we went with Raymour & Flanigan !!! We were treated with care and respect as we shopped for new living room furniture. No high pressure. Ken was wonderful, answered all of our questions, gave us lots of time to sit on the sofa and try the reclining functions. When we purchased this sofa and matching love seat, we were undergoing a major living room renovation. Painting and new carpet installation needed to be completed before delivery. Raymour and Flanigan held our new furniture for nearly 5 weeks. The delivery men were professional and careful with the installation. We would definitely shop at Raymour and Flanigan again. Cushions are firm and very comfortable. Love the look. Power features work great. USB port a bonus. Finally a comfortable power recliner! The Quincey Power-Reclining Sofa has arrived!! We are so excited to have this comfortable sofa in our living room. One of the many best features is the power head-rest. My husband is > 6.2 inches tall and this sofa is long enough to accommodate his "long legs." We highly recommend this sofa and Raymour & Flanigan - love their customer service! Absolutely love the comfort of our recliner set. My children call them giant marshmallows. So very happy with our purchase. Stylish and very comfortable. I feel confident that it seems so sturdy that it will last a long time. I absolutely love this sofa. My husband and I are tall people and our last sofa was so hard to get out of. It was well worth the cost and it feels like it will last us a long time. You have my vote for Customer Service. so far after a week we are very satified with our recliners. Comfortable material, seat and recline. Electronic controls easy to operate and have USB port. Very comfortable. Looks great in our living room. The motion mechanisms work great. Would highly recommend. We just love this sofa and recliner. Very comfy and firm. The recliner is a little too high in the seat, but I am sure it will go down a little with time. Other then that, its great. Comfortable for lounging yet stylish. This is an amazingly comfortable sofa to stretch across! But having the two recliners in it makes it even better! The flex steel let’s me know that it will keep its shape for years to come. I recommend this product because it is well made with material that will protect the couch from sinking. It also comes with lifetime warranty. Flexline sofa very comfortable. Recliners offer several positions both for the foot elevation, back and neck. USB ports on both sides offers convenience. I would highly recommend this couch. This is a great couch. Great back support. The polyester looks and feels like soft leather. It also reclines very quiet and smooth. I really like this sofa, feels great and it seems to be solid quality. Nice back support. We purchased a flex steel power reclining sofa and chair and are very pleased with them both. I've had this for a few weeks now and I am very happy. It is comfortable and looks great. We love the couch! Perfect addition to our TV room.. Unfortunately my son doesn’t want to get off it!! Lol Thank so much again!! Always buy from Raymour and Flanigan. We have always bought our furniture from Raymour and Flanigan. We trust the quality and service that we always get from them. Marie Watson was our sales associate and she was friendly and never pushy. She didn't try to up sell us into something we didn't want. She was there to answer any questions and was very knowledgeable. We love our new couch! It is so comfortable- how could it not be when the headrest is powered & adjustable? We are very happy with this purchase & with our first Raymour & Flanigan experience. Purchase the sofa, loveseat and chair. All power recline including the head rests which is really nice feature. My husband is heavy so we needed a set that would hold up and not become indented because of weight. So far, this set is living up to it's promise. It was a bit rigid at first but has since broken in nicely. I absolutely love the steel grey color as well. Very comfortable and looks great in our space. Haven't had it long enough to say how durable but it will be well tested in a house with two small children! 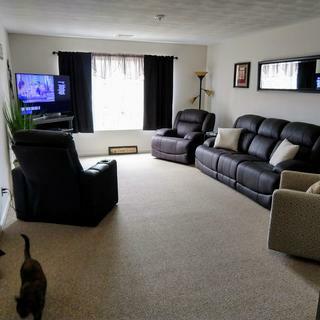 This is so comfortable, love the recliner and no problems with the cats or dog. Cat sits on back and dog in middle seat. Easy to recline and like that the head rest is adjustable. Love the gray color, goes with everything. I would recommend this sofa. Flexsteel is the way to go! Very impressed with construction, comfort and amenities of the couch and love seat. Purchasing with our R&F sales person was painless. When we met we said we were looking for a recliner sofa. He asked what we were most interested in, we responded QUALITY! He walked us right to this set. We checked out a few more but none compared and the decision was made! I think I made a good choice. They have strong Springs & feel firm,comfortable but soft. I like them & recommend them. So pretty and so confortable. I want to lay there all day! My kids already colored on it and it wiped right off with some water and soap. Couldn’t be happier! Fantastic couch great service at the store and delivery has fast efficient and professional. Very comfortable and exactly as seen in the store. This sofa is everything I wanted. It’s comfortable and I like that the cushions are attached. The reclining is great and the USB ports are a plus. Love the color. This sofa is prefect for our needs. The USB Charger is a really nice touch. The color is nice, but would have liked one of the optional colors, but the wait was too long. Love it. Suits our needs perfectly with all of the controls. My husband and absolutely love this sofa, it's extremely comfortable. It's nice because you can adjust the headrest too and there's a USB port next to the reclining controls so you can relax and charge your welcome. I really hate to give a review when I have had a product for less than a week but we really do love this product and hope it will hold up to many years of use. We have only had this couch for a week but it is very nice so far and feels like it will last - hopefully it will! My only complaint is that the USB charging port does not charge all electronics that well. Also with the 3 seats, the middle seat does not move and it can make snuggling next to someone sitting on the end a bit uncomfortable. We knew this going in but still something to note! Is this manufactured in the United States? BEST ANSWER: The Quincey Power-Reclining Sofa is not manufactured in the United States. i have a dog. Is the upholstery easy to clean? BEST ANSWER: This sofa is made up of 100% polyester which is stain-resist, very durable and easy to clean. Is there an electric plug on each side or just on one end of the sofa? There is one plug into the wall. There are charging ports on each end of the sofa. There is only one main cord that comes out from the center back of the sofa. One two prong plug, electric cord 78 inches with plug 80 inches long. It’s only one electric plug. Are the backs easy to remove to fit in a small front door entry way? BEST ANSWER: Ours was already apart when it was delivered. It seemed pretty easy for them to slide back into place. We have a small front door also and they fit through the door without taken the back off. can this be ordered in other fabrics? BEST ANSWER: Hello Maria, thank you for your interest in the Quincey Power-reclining sofa! The available fabric colors choose from are Smoke or Ash. For a complimentary sample of the upholstery, click on the "Order Swatch" link located just below the name of the merchandise on the web site. Please remember to include your complete name and mailing address. 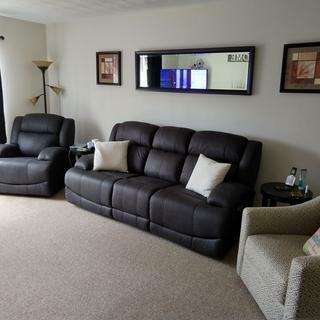 How much space is needed between the wall and sofa to recline? BEST ANSWER: Hello Lori, we recommend that the Skye Reclining Sofa should sit about 6 inches from a wall to fully recline. BEST ANSWER: I confirmed with the manufacturer that the power cord is 70.5"
BEST ANSWER: Please call 866-383-4484, option 3 for assistance with a military discount.